Designed for clinical, pharmaceutical, biotechnology life sciences and industrial standards the VWR Sanyo SR-L6111W Undercounter Lab Refrigerator is a durable, high quality addition to your lab. This unit is constructed for under benches or countertop use, with a front- breather condenser and no extra clearance around the top back or sides of the cabinet is required. In addition to being an under cabinet option, the VWR Sanyo SR-L6111W Undercounter Lab Refrigerator can be securely stacked for a fridge freezer combination, or placed side by side in a freestanding configuration. The VWR Sanyo SR-L6111W Undercounter Lab Refrigerator features an easy to read angled LED digital display and keypad, allowing the user a flexible range of temperature control. Once the temperature has been set, the controller can be locked to prevent set point tampering. Temperature control and uniformity is maintained with a door mounted microprocessor and interior forced air circulation. The door is also lockable with a key for safe secure storage, with an optional padlock hasp. 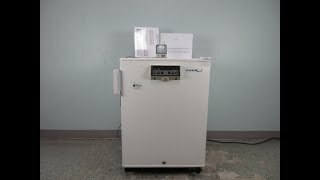 The VWR Sanyo SR-L6111W Undercounter Lab Refrigerator also features a variety of alarms from delay timed door ajar alarms, temperature set point monitors of critical variances, as well as the ability to connect the instrument to a central alarm system. The VWR Sanyo SR-L6111W Undercounter Lab Refrigerator also features a 3cm (13/16”) access port, adjustable wire shelves, and a right handed door swing. 20 x 14 x 27 "
The VWR Sanyo Lab Refrigerator was tested in house at 1°C and 10°C to ensure temperature set points were accurate. Unit is in excellent condition and ready to ship via freight. Don't hesitate to contact us with questions.